Since my original posting on three Indian women who attended the Women’s Medical College of Pennsylvania, I’ve gotten several inquiries for more information on their stories. There’s plenty of information on Joshi (see my comment on the original post), so I did some more research on Gurubai Karmakar. This is only a preliminary start—I plan to eventually sketch out a fuller story of the experiences of Joshi, Karmarkar and Chatterjee. Photo of Gurubai Karmarkar. From: Allen & Mason, A Crusade of Compassion for the Healing of the Nations (1919). 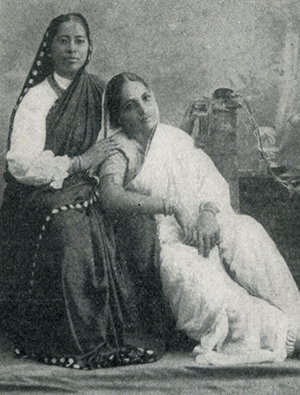 Gurubai Karmarkar attended the Women’s Medical College while her husband, Rev. Sumantrao Karmarkar studied at the Hartford Theological Seminary during from 1888s onwards. Both of their studies appeared to complement with their posts as Christian missionaries. 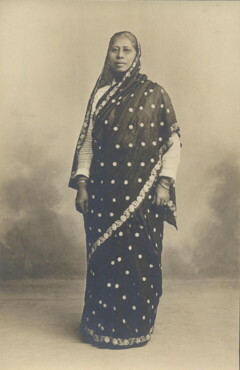 In 1893, they returned to India and Karmarkar took up a position at the American Marathi Mission in Bombay, where she would work for over thirty years. At the meeting, Karmarkar adorned a sari and the meeting records also refer to a Mrs. Vaitse and a Mrs. Miyagawa, who also wore their national dresses. Karmarkar attended the Young Women’s Christian Association (YWCA) meetings in Paris (1906) and Stockholm (1914). Supposedly, in 1919 she also attended the first International Conference of Women Physicians held at the YWCA headquarters in New York, which had attendees from 32 countries for 6 weeks; I haven’t been able to verify Karmarkar’s attendance. She also appeared to have attended a meeting of the American Board of Commissioners for Foreign Missions in October 1917 in Columbus, Ohio. She shared her notes on the medical work being done in India for lepers and the “criminal caste.” It’s likely her work with lepers inspired the American physician and surgeon, Arley Isabel Munson Hare (1817-1941) who also studied at the Women’s Medical College. Hare graduated in 1902 and eventually made her way to Bombay, staying with Karmarkar until she began her medical/evangelical mission working with lepers in Solapur. The Bombay mission Karmarkar worked at also played a crucial role during the plague outbreak of 1916. Many people came to the overcrowded dispensary for inoculation and Karmarkar found “wonderful door of opportunity [to improve public health] through her professional visits to the homes of all classes, from the poor women of the weaver castes to Wealthy Parsi and Mohammedan ladies, some of who is always ready to come to them when their call of distress comes to her ear.” After her retirement, she donated funds to open the “Dr. Gurubai Karmarkar Wing” at Lincoln House in Bombay, now the Nagpada Neighborhood House. Although my going to Baroda [Vadodara] was an altogether unexpected step, yet on looking back upon a year of labor, with many thrilling and instructive experiences crowding into my memory, I earnestly thank God for his manifest guidance and help. The position of physician is a secular one, yet there was nothing in my office calculated to interfere with my freely speaking on spiritual matters, and showing an example of what a Christian life means. Almost without exception the homes of the people, from the smallest to the greatest, have been pleasantly thrown open to welcome me. But amid much that gladdens and cheers one, there is a deeper and predominant feeling of keen sorrow and concern for the thousands of women victims of the present system of Indian life, and realization of the imperative need of more penetrating and thorough Christian influence, to lighten the gloom of error and superstition which hangs like a cloud over the lives of rich and poor alike. Provision has been made for a certain amount of education, but the effectiveness and the results that might be expected are largely crippled by the fact that in Baroda the purdah system is more rigidly enforced than in many other states. One night at twelve o’clock I was called to see a woman who had given birth to a child, and was suffering from high fever. Upon examination I found that there was no serious complication, and concluded that she would speedily recover. But the fever still remained, and the parents became still more frightened on account of the plague prevailing in the city. Upon further scrutiny I noticed that the people of the house had a large lamp burning night and day in the room, in addition to a couple of charcoal braziers. So I determined seriously to interfere with the existing sanitary arrangement of the sick chamber. I ordered the lamp to be removed; had the bed dragged from its dark corner to the vicinity of the window, substituting some warm clothing for charcoal fires. That very night there was a decided change for the better, and after a few days that patient was completely well. This occurred in an educated household, where custom compelled them to have dark rooms vitiated by charcoal fumes and other unsanitary measures, even, to the detriment of their own kith and kin. Roughly, I have medically treated about 11,000 women and children, a large number of whom have shown signs of deep gratitude, which must inevitably tend to remove from their minds any pre-existing prejudice against Christian workers. Belle J. Allen and Caroline Atwater Mason, A Crusade of Compassion for the Healing of the Nations: A Study of Medical Missions for Women and Children (West Medford, Mass., 1919). Frances Dyer, Looking Back over Fifty Years. Women’s Board of Missions (Boston, MA, 1917). V.P. Rao, “Genesis, Rise and Socio-Cultural Development of Maharashtra” (2012).